Artist/creator Theo Tso has teamed up with writer/editor Rob Schmidt, colorist Edmilson Witchmichen, and letterer Kurt Hathaway to launch Captain Paiute: Indigenous Defender of the Southwest, a Native American take on the superhero genre. Growing up on a reservation, Luther Pah learns the ways of his ancestors and thirsts for more. He leaves to study science so he can protect his tribe’s resources, but a family tragedy calls him back. Noting the crime and corruption on the rez, he wonders what he can do—until Pah the water spirit shows him. As a tribal hydrologist by day and a superhero by night, Luther and his alter ego must protect their Southwestern homeland from harm. Only Captain Paiute can ensure that the land, water, and indigenous way of life continue as they have for 10,000 years. With pipeline protests leading a tribal resurgence, the time for Captain Paiute is now. Fans of rollicking adventures that deal with down-to-earth problems will enjoy the comic book’s mix of fantasy and reality. 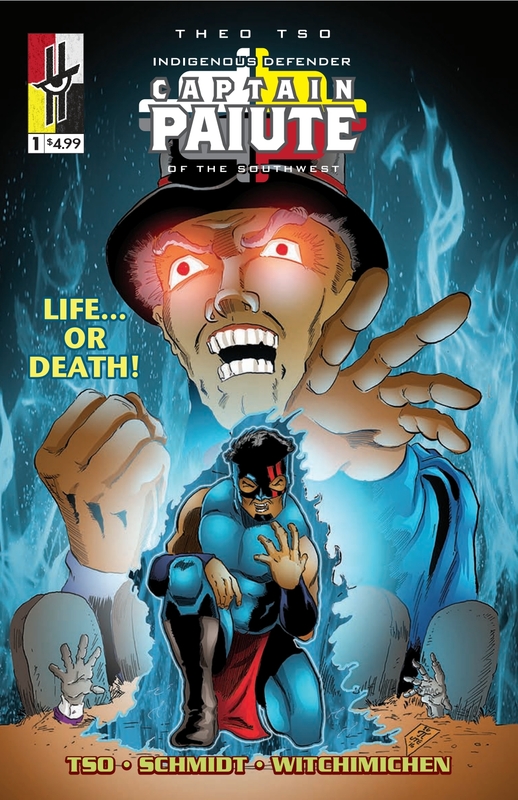 Captain Paiute #1 is 24 pages of full-color action. Readers can purchase it for $4.99 at War Paint Studios (http://www.warpaintstudios.net/).